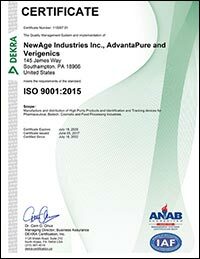 Southampton, PA — After several months of preparation, the AdvantaPure high purity products division of NewAge® Industries, Inc. has received ISO 9001:2015 certification. This updated certification helps demonstrate the company’s commitment to quality and its ability to consistently provide products that meet its customers’ stringent requirements. AdvantaPure manufactures AdvantaSil™ platinum-cured silicone tubing and reinforced hose, AdvantaFlex® tubing, and Single-Use molded manifold assemblies and components for the biopharm, pharmaceutical and clean application industries. The new certification also applies to the company’s Verigenics® division, which offers RFID technology that enables medical device, pharmaceutical and other regulated companies to track and authenticate consumables, assets and equipment. Differences between the ISO (International Standards Organization) 9001:2008 requirements and those for ISO 9001:2015 include an increased focus on risk-based thinking and assessment, greater emphasis on leadership involvement and more focus on supply chain. ISO 9001:2015 also uses simplified language and updated terminology. Team members at NewAge Industries initially met in mid-2016 to begin reviewing the new requirements. The group consisted of team leaders, internal quality auditors and managers who worked on process flow charts, quality manual revisions, work instructions and the company’s Business Management System. Once tasks were completed, a registrar’s audit took place, resulting in receipt of the ISO 9001:2015 upgrade. For more information on AdvantaPure's products, visit www.advantapure.com or contact the AdvantaPure team at 145 James Way, Southampton, PA 18966; phone 888-755-4370 or 215-526-2151; fax 888-258-4293 or 215-526-2167; e-mail: sales@advantapure.com. The AdvantaPure division of NewAge Industries is ISO 9001:2015 certified and specializes in high purity tubing, hose, Single-Use process tubing manifolds, BioClosure® container closure systems, and other molded components for the pharmaceutical, biopharm, biomedical, food, beverage and chemical industries. Products are manufactured, stored and shipped using methods that ensure product purity. In business since 1954, NewAge Industries manufactures plastic and rubber tubing in reinforced and unreinforced styles. NewAge Industries maintains a large inventory of tubing and fittings for its core product lines, provides custom extrusion and fabrication capabilities, and services customers worldwide. Automated product identification systems, including gamma-stable RFID tags and labels, are offered by NewAge's Verigenics® division. In 2006, NewAge initiated an ESOP (Employee Stock Ownership Plan) for the benefit of both its employees and customers.